Legislature Steps Up Palin Ethics Investigation. If you’re marking your calendar with upcoming Alaska political scandal “Dates to Remember”, it’s time to get out your eraser. The release date of the Palin ethics investigation has moved…but not in the direction you may think. Friday is obviously a big news day up here in Alaska. And now, the latest on the jousting match between teams French/Branchflower and Palin/Van Flein. The Palin/Van Flein strategy has been to stall, stonewall, dig in their heels, grit their teeth, throw grenades, light fires, and jump in the bunker. It seems to be meeting with limited success. Despite Palin filing an ethics complaint against herself to force an investigation by a friendly self-appointed board, the Legislature, under the leadership of Democrat Hollis French, chair of the judiciary committee, marches on. It remains to be seen how they will pull this off, but subpoenas must be just around the corner, because both Frank Bailey (the Palin staffer whose phone call to Troopers was recorded), and Sarah Palin who originally said she’d be completely cooperative, have refused to testify. Also, Republican Rep. John Coghill is now asking for Hollis French to step down from his leadership role stating that because he’s used the word ‘impeachment’ more than once, and has stated he feels the whole thing will be ‘damaging’ for her, he is no longer impartial. Sarah Palin’s Preacher Problem. End Times Coming? Good Lord. Another ‘gate’. Just talked to one of our local progressive radio talk show hosts (yes, we have them in Alaska!) and she said her head is spinning. Mine is too. No one knows where to turn. Keeping up with the tidal wave of what’s hitting the fan in Alaska is fast becoming a full-time job. It feels like that old-time video game “Centipede”. It’s easy at first to blast those little centipedes as they work their way down the screen, but the longer you play the faster they come and bigger they get, and the more you have to work to keep them in check. There’s fundraising for indicted senator Ted Stevens’ 547, not actually knowing “what the VP does all day”, her affiliation with the secessionist Alaska Independence Party, earmarks after earmarks for her small town projects, zero international experience, Troopergate, Babygate, Dairygate, Bridgegate, Toddgate, and now…..Churchgate. I’ve picked this particular centipede today, (shall we call it the Jesus-pede?) because this is something that crosses the line between a candidate who is unqualified, and a candidate that is not using the same play book as most of the rest of us. I did a drive-by of Palin’s church when I was traveling through Wasilla yesterday, not realizing the furor that would be churning the blogosphere less than 24-hours later about a speech Palin delivered there only three months ago. Here’s what she said regarding the war in Iraq. That’s what we have to make sure that we’re praying for, that there is a plan and that that plan is God’s plan. So the plan is to pray for a plan? Perhaps it would have been better to pray for a plan beFORE we went to Iraq. Better still to sit down and create a plan – a thoughtful, intelligent, human-type plan. Knowing that Palin has only been out of the country once, in 2007, to visit the Alaska Guard in Kuwait, we rightfully wonder what might influence her international policy. How will her decisions be made? What is her style of governance? Well, folks, this might just be it. Pray for a plan and hope it’s the right one. Beyond that one speech she made in June, what else do we know about Palin’s church? Good question. Anchroage residents, who comprise the vast majority of the population in this region of Alaska, know that Wasilla is the heart of Alaska’s Valley Bible Belt. This is evidenced by the dozens and dozens of roadside churches, the Christian schools and bookstores, and how many people are wearing crosses in the local supermarket. But I, and most others I know really don’t know much more than that. But, the press, bloggers, and curious citizens are now McCain’s post-facto vetting team, and they are opening can after can of worms. What you see in a terrorist — that’s called the invisible enemy. There has always been an invisible enemy. What you see in Iraq, basically, is a manifestation of what’s going on in this unseen world called the spirit world. … We need to think like Jesus thinks. We are in a time and a season of war, and we need to think like that. We need to develop that instinct. We need to develop as believers the instinct that we are at war, and that war is contending for your faith. … Jesus called us to die. You’re worried about getting hurt? He’s called us to die. Listen, you know we can’t even follow him unless you are willing to give up your life. … I believe that Jesus himself operated from that position of war mode. Everyone say “war mode.” Now you say, wait a minute Ed, he’s like the good shepherd, he’s loving all the time and he’s kind all the time. Oh yes he is — but I also believe that he had a part of his thoughts that knew that he was in a war. How will the Republican party and the pundits handle Palin’s “Reverend Wright Moment”? Did McCain vet her on matters of her religious ties, knowing how devastating the impact of his church selection turned out to be for Obama? You’d think. But maybe McCain knew all along, and thought it was no big deal. Which scenario is more sobering? And how do non-Christians in the rest of the country and in Alaska feel about the “end times” philosophy of this church? 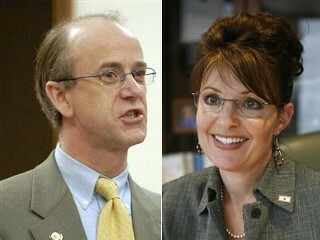 Is this one more step toward the End Times of the McCain-Palin ticket? Let us pray. Palin is Lawyered Up and Ready to Joust. Take a few hours off, and see what happens? Apparently it’s not possible to blink these days without missing the latest bit of Palin drama. While I was out snapping photos of the governor’s home town of Wasilla and its environs, the state of Alaska was busy running an errand for Sarah – finding her a lawyer. Yes, she’s lawyered up. And the sparks are flying already. It all goes back to Troopergate. If you need to consult the Troopergate Primer, go HERE. We’ll wait…. Now, we’d like to welcome our newest player to the growing cast of characters in our little drama – Thomas Van Flein. Mr. Van Flein (don’t you just have to say that with an accent?!) has been hired to represent Palin in the upcoming legislative investigation into the firing of Commissioner Walt Monegan. “But wait!” you may be asking, “What about the state Attorney General? Why can’t he handle this?” Why not AG Talis Colberg? Well, he’s the one that Palin sent out to do a pre-emptive sleuthing campaign to see what the Legislature was going to find out when they investigated her. Just so she’d have a heads up. So now Colberg, who has already been talking to everybody and his uncle about the Trooper, including Walt Monegan, has now opened himself up to being called as a witness! So he’s out. (And incidentally, he’s also going to take over the role of Governor of Alaska should Palin end up as the VP, and her Lt. Governor Sean Parnell win his bid for Alaska’s sole House seat. My head hurts). Now that John McCain has gotten his mits into this mess, the McCain/Palin campaign has put together a four-page statement saying that her husband Todd Palin and members of her administration had simply inquired “about the appropriate Department of Public Safety procedures for dealing with someone they considered a dangerous person and rogue trooper.” No pressure, just simple friendly inquiries. BUT, they say, keep in mind that Sarah Palin herself only became aware of her husband’s and all those other people’s ‘inquiries’ very recently, long after they were made. Because married people don’t talk about things like exacting vengeance on dastardly ex-brothers-in-law (on whom they’ve filed dozens of complaints) with each other. Todd did it all on his own. That rogue! Here’s where the gloves come off. Van Flein, Palin’s new lawyer, says that the state legislature shouldn’t be handling the investigation at all. It would be much better, he says, if the state Personnel Board (a three person board appointed by Sarah Palin herself) did the investigation. And Van Flein also asked for all witness statements, documents and other materials collected in the course of the legislature’s investigation. Palin and Van Flein vs. French and Branchflower. Doesn’t that sound like some kind of epic medieval jousting match? Good analogy. OHHHHH. 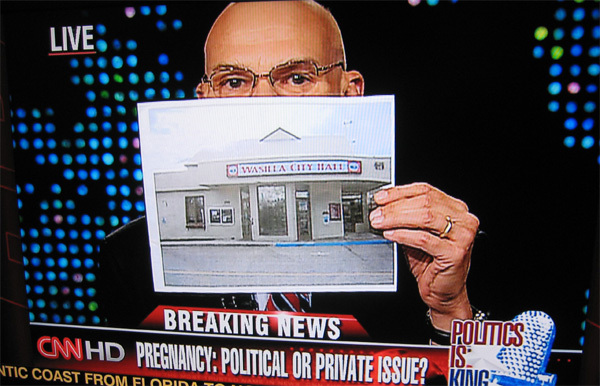 Name calling metamorphosis imagery and conservative hot button issue! FOUL for Van Flein! And now French galloping at full speed…. “How does Van Flein explain the unanimous vote (to pursue the investigation of Palin) by the Republican-dominated Legislative Council?” OUCH! Van Flein is off the horse. Boy that had to hurt. OK, now Branchflower is ready to take on Palin for some questioning. But…where is Palin? Is Palin in the house? (looking around) Ohh that’s right…busy with that Vice Presidential thing. Van Flein, dusting himself off, pipes up: The investigation is “bad timing” in the middle of a presidential campaign! Methinks the presidential campaign is “bad timing” in the middle of an investigation. But that’s just me. Palin has just released documentation indicating that she will attempt to scuttle the investigation by the Legislature and steer it to the control of the State Personnel Board, a 3-member board that Palin herself appointed. The stall tactics begin. The McCain campaign does NOT want a Legislative investigation, and they don’t want the results of that investigation to come 5 days before the election as it is scheduled now. More shenanigans to come, I’m sure. A Photo Safari of Wasilla, Alaska – Home of Sarah Palin. Time for a caption contest! Anyone? I’m finally home with high speed internet, and able to post the photos from my little trek through Wasilla and the Mat-Su Valley this weekend. First a big hat-tip to my spouse who chauffeured me around Wasilla for two hours this afternoon and obeying dutifully every time I yelled “STOP! !” I tried to capture the spirit of what makes the Valley unique, so I didn’t photograph Home Depot, or Walmart, or Lowe’s. 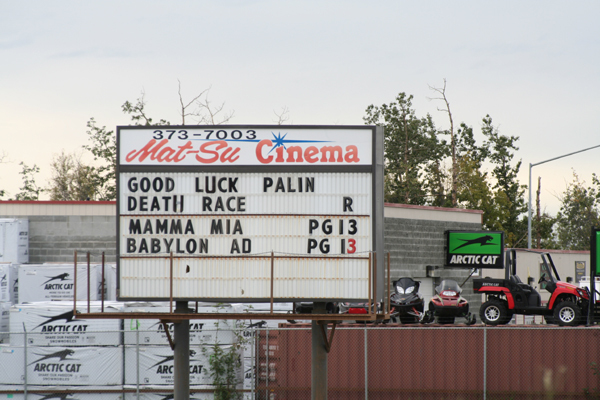 There were some interesting signs of Palin around. And I ran into a friend who was sporting a McCain – Palin t-shirt. I said, “So you’re a fan?” and she said, “I LOVE Sarah! She’s my hero. I just need to get some duct tape to stick over the McCain part.” A new and interesting perspective. There are lots of them. I have good friends and family who live in Wasilla and other parts of the Valley. The Valley is quirky, occasionally scary, often funny, and sometimes just downright unexplainable. Anyone from the area will recognize many, if not all of the places I photographed. All the Wasilla photos were taken on main roads. Click on the photo to get a caption. I hope you enjoy your virtual Alaskan safari through the Valley, where Sarah Palin has lived and was raised since infancy. This is her world folks, and her executive experience before she became Governor in 2006. Buckle up. Use the photos as you will but please credit https://mudflats.wordpress.com if you do. Thanks. 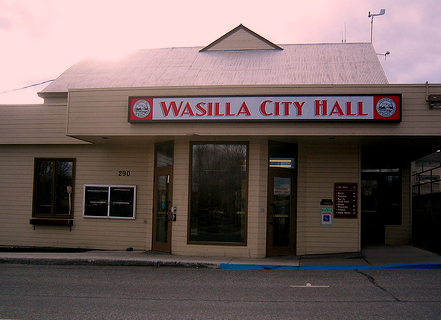 And Wasilla City Hall as seen on CNN. Hat tip to the Ragin’ Cajun and Mad Skillz. The story has broken and we now know which version of “Babygate” is true. Palin’s unwed 17-year old daughter is pregnant. Palin, who arrived in St. Paul today to accept the Republican nomination for vice president, sent out a joint statement with her husband, Todd. “Our beautiful daughter Bristol came to us with news that as parents we knew would make her grow up faster than we had ever planned,” they said. “We’re proud of Bristol’s decision to have her baby and even prouder to become grandparents. As Bristol faces the responsibilities of adulthood, she knows she has our unconditional love and support. “Bristol and the young man she will marry are going to realize very quickly the difficulties of raising a child, which is why they will have the love and support of our entire family. We ask the media to respect our daughter and Levi’s privacy as has always been the tradition of children of candidates,” the Palin family statement concluded. The fact that Palin had a 16-year old who got pregnant out of wedlock was presumably unknown by the McCain people. After all, he only met her twice, and probably never met any of her children. And it was obviously too much of a bother to vet the candidate and at the very least know in advance what kind of sensational and unwanted headlines might follow. AND, Palin didn’t volunteer this information. Our Republican Vice Presidential candidate is a person of questionable judgment. I don’t think there are many out there who would disagree with this statement at this point. So, in the first three days, she’s lied about saying “Thanks but no thanks” on the bridge to nowhere, and withheld information from the campaign she’s supposedly trying to help, that could be devastating to McCain. At the very least, it sure doesn’t help. What’s next? As I said before, this may be the tip of our Alaskan iceberg. There are ‘gates’ a-plenty out there that are just waiting for some pretty basic investigation to reveal their secrets.